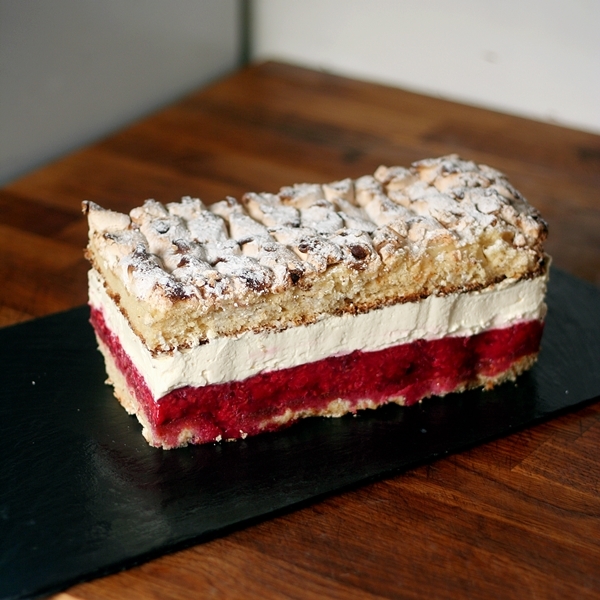 It’s been a while since I posted a cake recipe, so I thought I’d cheer up the chilly weather with a cakey treat. I was initially a little conflicted about this cake: on the one hand it tastes amazing, but then it also falls into the category of my pet hate of ‘food looking like something that isn’t food’, even though it is achieved almost by accident. In the end the ease of baking/construction, coupled with the amazing flavours persuaded me to bend my own rules and I hope you’ll be as delighted with the result as I am. It’s very straightforward, based on a chocolate sponge, and takes almost zero skill to put together. Huzzah! I found it on a Romanian version of Pinterest, and it appears to be something Romanians can create from a Dr Oetker box cake mix. However, there’s no need to resort to box cake mixes, no matter how convenient they might be. Hands up anyone who has eaten one and thought “Oh my! This tastes so convenient!”. So this is a hand-made version, which is only marginally less convenient but with added fresh, natural ingredients. I call it the very best kind of clean eating. I might start a food trend….. Requiring just 2 bowls – one if you rinse it out after mixing the cake – it also requires practically zero washing up! Bonus! The cake is my go-to, one-bowl chocolate yogurt cake, so easy you could mix it with just a spoon – although I recommend a balloon whisk. Once baked and cooled, the cake is hollowed out and the bottom filled with whole (or as whole as possible) bananas, then a creamy filling mounded on top. The cake that was hollowed out, plus any excess you cut off to level the top, are blitzed to crumbs and patted onto the mound of cream and voila! Something that resembles a molehill but with a much more appetising taste! You can make one large cake, or, as I managed, one large and several small, individually-sized versions. The filling can be as simple as sweetened, whipped cream, a custardy diplomat cream (crème patissière + gelatine + whipped cream) or, my favourite, a combination of cream cheese, crème fraiche and double cream, whipped to firmness with a little vanilla paste and icing sugar. Also optional is whether or not to include some chocolate in your creamy filling. My daughter voted for chocolate chips in an earlier version (she also preferred diplomat cream), however I went for hand-chopped chocolate. Other options might be pure chocolate sprinkles or indeed none at all. The comforting combination of the richness of the chocolate sponge, the freshness and sweetness of the banana, the creamy topping and the novelty of the overall appearance have immediately shot this cake into my top five list. In fact, the only downside of this cake is the time spent waiting for the cooked cake to cool down before you can fill it! Line the bottom and sides of a deep 20cm cake tin with baking parchment. Put oil, yoghurt, syrup, caster sugar and eggs in a bowl and whisk together until well mixed. Sift flour, cocoa, bicarbonate of soda and salt into the bowl. Mix well. Bake in the oven for 60-75 minutes, until the cake has shrunk away from the sides, no bubbling sounds can be heard and a toothpick inserted into the cake comes out clean. Yes, it does seem a long time, but the low temperature means it really needs the full allowance. The result is a beautifully-textured cake that actually improves on keeping, if you want to make it ahead. Additionally, the low-and-slow cooking means it is invariably gently and perfectly rounded on top and without any cracks. Cool for 10 minutes, then turn out onto a wire rack and allow to cool completely. Mix the cream cheese, vanilla paste and creme fraîche thoroughly. Add icing sugar to taste. Add the double cream and whisk until firm. Stir through the chopped chocolate. Cover with plastic and chill until required. Cut the cake horizontally at a height of 4cm. If the cake has risen a lot, you might be able to cut it in half and make 2 large molehill cakes. Alternatively, you can cut out circles of sponge from either one or both halves using a baking ring to make individual-sized portions. Cut a circle 2cm deep around the edge of the cake, 2cm from the edge. Hollow out the middle of the cake so that the remaining sponge resembles a tart case. Be careful not to cut through the bottom of the cake. Reserve the cake scraps. Lay whole bananas in the hollow, making sure they cover the whole of the bottom of the cake. Pile the cream filling on top, using a palette knife to shape it into a tall mound. Blitz the cake scraps to crumb and press lightly onto the sides of the cream until completely covered. You can serve the cake immediately, but it does benefit from being wrapped in foil and thoroughly chilled in the fridge for at least 4 hours. Overnight is ideal. Remove from the fridge 30 minutes before serving. We’re back to the history books this week, with an original Simnel recipe from the 1650s. And yes, I’m exactly a week late, since they were originally enjoyed on Mid-Lent Sunday, which has, over the years, segued into Mothering Sunday/Mothers’ Day. Still, they were popular throughout the Easter celebrations, so there’s still time to rustle some up if you feel inspired. Three regions of Britain lay claim to strong Simnel traditions: Devizes in Wiltshire, Bury in Lancashire and Shrewsbury in Shropshire. The Devises Simnel is recorded as being star-shaped and without a crust, and the Bury Simnel is traditionally flat, but the Shrewsbury Simnel was the most popular and which went on to develop into the Easter cake we know today. 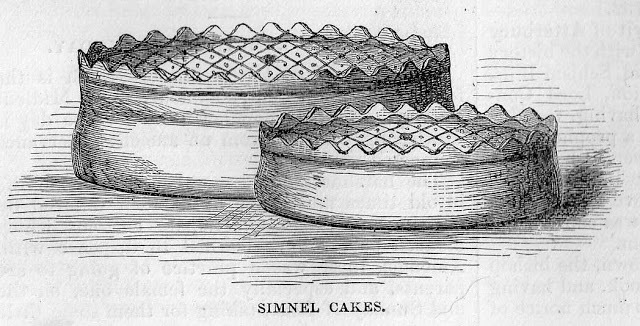 The Shrewsbury Simnel of 350 years ago was much different to the traditional almond-paste-filled cake made today. Originally, it was an enriched and fruited yeast dough wrapped in a plain, yeasted dough,and then boiled before being baked, in a method similar to the way modern bagels are made. There are similarities with today’s Scottish Black Bun, the difference being both the use of unleavened pastry and the much richer filling of the northern version. Whilst descriptions and images of what Simnels looked like are well known, recipes have, to a great extent, been either extremely vague or pretty much guess-work, as all the original recipes have vanished over the years. 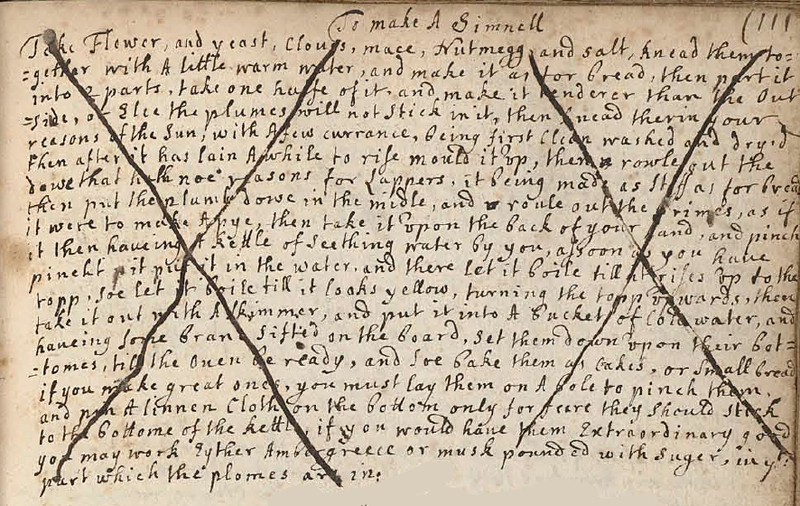 For, as I was browsing through the digitised 17th century manuscripts of The Wellcome Library, I found a recipe for a Simnell. It’s made in the traditional manner of first boiling then baking, and someone has subsequently crossed it out, but it’s still legible and much older than anything I’ve been able to find until now, so in terms of authenticity, that’s good enough for me. It’s a little sparse on quantities and details such as cooking times and temperatures, but there was enough for me to muddle along with my own interpretation. Interestingly, there’s no mention of the traditional saffron flavouring, these cakes being ‘gilded’ with egg-yolk glaze only, so maybe the use of this spice was a later development. The recipe says to “take it upon the back of your hand and pinch it” – difficult for a large sized cake. The baking instructions are “bake them as cakes or small bread” – so bread roll size rather than loaf sized. Mention I found of cymlings or simnels in the notes of early American settlers on the local vegetation. We plant also Cucumbers & Pompions, the common, & the Indian kind with a long narrow neck, which from them we call a Cushaw. Of Melopepones or the lesser sort of Pompions there is also great variety, all which go by the Indian name of Macocks; yet the Clypeatae are sometimes called Simnels & because these others also from the Lenten Cake of that name which some of them very much resemble. Earlier, in A Description of New Albion (1648), Beauchamp Plantagenet (what an AWESOME name!) observed “strawberries, mulberries, symnels, maycocks, and horns, like cucumbers” on Palmer’s Isle (now called Garrett Island) at the northern end of Chesapeake Bay. 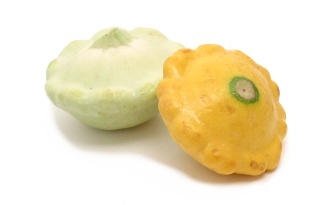 The vegetable they both refer to is nowadays more commonly called the pattypan squash. The recipe below will make four, individual-sized Simnels. Feel free to enrich the filling for the dough even more by adding extra fruit, spice peel, sugar, butter and eggs. The mix below, however, will make a delicately spiced and fruited tea bread that is delicious on its own as well as spread with butter and/or toasted. Provided your Simnels don’t burst their seams during baking, the hard outer dough will ensure that they keep very well for a couple of weeks. Sift the flour, salt, spices and yeast into a bowl. Slowly add enough warm water to bring the ingredients together into a firm dough. Put into an oiled bowl and cover with plastic film. Set aside to rise for 1 hour. 2 large egg yolks for glazing. Cut the butter into small pieces and put into a pan with the cream and the sugar. Whisk the egg and add to the warmed ingredients. NB Make sure they aren’t so hot that they cook the egg. Add the liquid ingredients to the flour mixture and knead for 10 minutes. Put a large pan of water on the cooker to boil. I use my preserving pan. Do it now because it will take practically the whole hour to come to heat up. When the dough has doubled in size, knead in the raisins and currants. Divide the plain dough into 8 even pieces and roll each piece out thinly (3mm). Line 4 small deep pie/tart tins with cling film. This will help turn out the finished cakes. Use 4 pieces of plain dough to line the tart tins. Leave the excess dough hanging over the edge of the tins, as it will help in forming a good seal around the cake dough. Chill in the fridge together with the remaining pieces of dough, which will form the lids, for 20 minutes. This chilling will firm up the dough and make it easier to form the crust on the cakes. Divide the fruit dough into four and knead until firm and smooth. 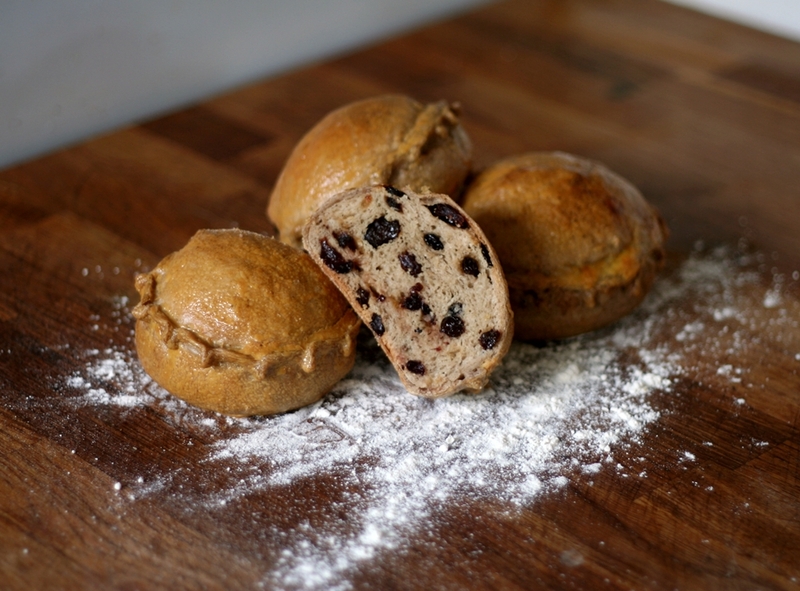 If you’ve added extra fruit or your tins are on the small side, you may need to reduce the size of the dough balls. Remove the chilled dough from the fridge. It is best to form one cake and then place it in the hot water immediately. If left to one side while you make the other cakes, the dough will warm up, rise and potentially burst its seals. Place a ball of fruit dough in each tin. Moisten the edges of the dough with water and cover with one of the dough lids. Press firmly and pinch together to form a seal around the fruit filling. Trim any excess dough. Crimp the edges of the cake according to your own design. When the water is simmering, place each cake on a skimmer and slowly lower into the water. It will sink to the bottom of the pan initially. When the cake rises, use a skimmer to gently turn it over so that the lid cooks for about a minute. Lift the cake from the hot water and lower it gently into the bowl of cold water. When cooled, set the cake onto a silicon sheet (so that it doesn’t stick) to dry. Repeat for the remaining cakes. Place the Simnels onto the baking sheet. Brush with beaten egg-yolk to glaze. Bake for 45-50 minutes until firm and golden. They should sound hollow when tapped on the bottom. Don’t be tempted to take them out too early, even with the dip in the hot water, these will take a relatively long time to bake.